Every application that we create needs to save its data to a persistent storage like a database. Our database, which is relational in nature stores the data in rows and columns. If we analyze our code you will notice we spend lots of our time and effort in handling the nitty-gritty of saving data to the database or retrieving the data from the database. The impedance mismatch can be solved by using a mechanism which takes the application objects and saves it as a row and a column in the database. That is what ORM framework does. ORM Stands for Object Relational Mapper. ORM tools decouple the object model from the database by creating an abstraction layer between them. ORM translates domain classes into rows and columns in the database tables. ORM Tools separates the representation of a data store from the implementation details of the store itself. The Microsoft Entity Framework is Microsoft’s implementation of ORM Framework. The applications created using the EF does not work with the database directly. The application works only with the API provided by the EF for database related operations. The EF maps those operations to the database. The above image shows the high-level architecture of the EF. 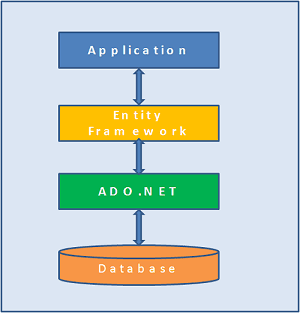 You can see that the EF uses ADO.NET to perform the operations on the database. Developers spend lots of time coding the plumbing required to save the data to the data store. EF Reduces this time, hence the developers can spend time actually building the application. Developers can work against domain specific objects such as employee and employee address and need not to worry about how and where these data is stored. Applications are now easier to maintain as the amount of code is reduced. Reduced code also increase the productivity. Entity framework became open source with this version. Some of the major features that were added are multiple-diagrams per model, coloring of shapes on the design surface and batch import of stored procedures. This release added Code First Migrations. Model-first workflow was introduced in this version along with POCO support, lazy loading, improvements in testability etc. bravo to your easy to understand style of teaching!